2 year term, with opportunity to extend for a further two years. UCA Students’ Union strives to make student life better for the 6,300 students studying at the University for the Creative Arts, a specialist creative arts university across four campuses throughout Kent and Surrey. Oscar-winning film makers, world-renowned fashion designers, television presenters, celebrity jewellers and Turner Prize nominees are just some of the high-profile graduates from the University for the Creative Arts. The Students’ Union has clear direction and strategy in place to guide us toward being a bolder, more relevant union. We are focused on the future and on growing to be even more of an asset to our members. All of our students are empowered to flourish in their passion and their individuality in becoming the new wave of creatives. Championing students’ ideas, removing barriers to education and empowering students to flourish creatively and individually. Theme 2 – A transformative education; which means that all students can thrive during their time at UCA and beyond. UCASU has grown through a significant period of organisational turnaround. In the last two years, UCASU has put in place a new Board, senior team and staffing structure. 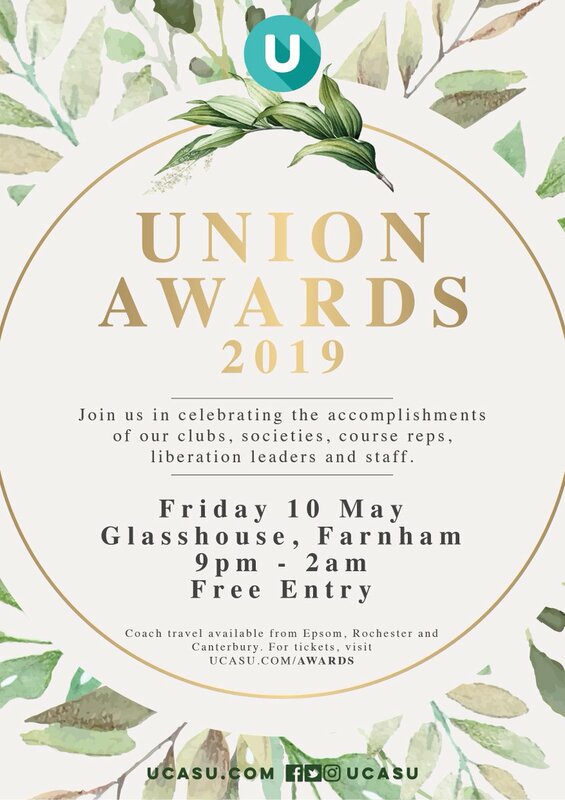 This approach has already seen meaningful change and success, with course representative numbers up from 13 to over 300, clubs and society numbers increasing more than tenfold and UCASU winning Best Small and Specialist Union at the 2016 NUS Awards. We have implemented new liberation groups and undertaken work to increase our engagement with students from marginalised backgrounds. This has resulted in elected student representatives that are more reflective of our diverse student body, and a team that is able to be increasingly relevant to what our students actually want from their Students’ Union. We plan to build on our growth as a union, to become even more competent and relevant to the UCA student body. The team at UCASU are now seeking new external trustees to join the Board and help support further growth, success and ultimately pave the way for the new wave of creatives. Women and BAME candidates are of particular interest to us, as we seek to make our Trustee Board more reflective of the demographics and experiences of our students. With an opportunity to undertake a second term. Time Commitment Between 4 and 6 meetings per year plus optional additional events in between. Remuneration Out of pocket expenses for travel and subsistence. As a member of our Trustee Board you will uplift and scrutinise the strategic direction of UCASU. You will encourage the organisation to deliver a creative and exciting environment in meeting our aim of making student life better. Ensure that UCASU works in accordance with the Constitution. Ensure that UCASU uses its resources effectively and does not spend money on activities outside its remit, no matter how worthwhile or charitable those activities are. Contribute actively to the Board of Trustees’ role in giving firm strategic direction to the Students’ Union, agreeing and monitoring overall strategy, setting targets and evaluating performance against agreed targets. Safeguard the good name, reputation and values of the Students’ Union. Ensure the financial stability of the Students’ Union. Protect and manage the property of the charity and ensure proper investment of the charity’s funds. Ratify the appointment of the Chief Executive and monitor their performance.